One of the most common reasons for heating repair service in New Jersey is a gas furnace that won’t ignite. In New Jersey’s frigid winter climate, it’s nearly impossible to go without a working heater for very long at all. A failing ignition can make your gas furnace unusable, creating a serious problem for you and your family. There are several different reasons why your electric ignition or pilot light might not be working correctly. In most cases, you’ll probably have to call a professional for heating repair service. Gas furnaces can use a couple of different kinds of devices to provide the ignition source that allows the gas to burn, warming the air in your home. These mechanisms can be either flame-based, or electrical. Pilot lights. The pilot light may be the most familiar type of gas furnace ignition. A pilot light is a small, gas-powered flame, which ignites another, more powerful gas burner. Intermittent pilot switches. These use a small electric spark to ignite the gas. Hot surface switches. As the name suggests, hot surface switches use an electric heating element that causes the gas to ignite. A gas furnace from manufacturers like Trane, York, and Carrier may use any of these types of ignition systems, and it’s useful to know whether yours has a pilot light or an electrical ignition switch. End of lifecycle. Although a gas furnace itself can last for up to fifteen years with occasional furnace repairs, some elements will need to be replaced sooner. One of these elements is a hot surface ignition switch. These are only designed to last for about three years before they fail, at which point a heating repair contractor will need to install a replacement part. Improper handling. If you mess with the ignition switch without knowing what you’re doing, you could damage it accidentally. 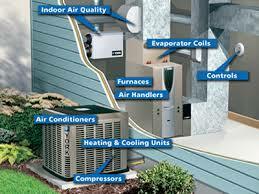 Heating repair and furnace maintenance are best handled by a trained HVAC professional. Running the ignition switch too high. This can damage the electric ignition, causing it to fail prematurely. Dust and dirt buildup. Over time, dust, dirt, and debris can build up on your furnace’s electric ignition. If the problem gets severe enough, it can impede your furnace’s ability to ignite. Faulty control boards. Sometimes, the problem isn’t the ignition itself, but your gas furnace’s control board. This component is complicated to fix, so you’ll almost certainly need professional heating repairs. Faulty safety switch. The safety switch is a very important safety feature, since a natural gas leak is both highly toxic, and a serious fire hazard. If something’s wrong with the safety switch, your gas furnace may fail to ignite. Tripped circuit breaker. Fortunately for homeowners, this is fairly simple to fix. Thermostat problems. If the problem isn’t your electrical ignition, it might be a faulty thermostat. If so, you may want to replace it with an energy-saving programmable thermostat. Problems with the thermocouple. A thermocouple is a safety mechanism that detects whether or not the pilot light is lit, using a metal rod connected to the gas valve. This is responsible for lighting the burners. If the pilot light is out, the thermocouple will shut off the gas supply, so that natural gas can’t build up inside the furnace and explode when reignited. Thermocouples can come loose and malfunction, in which case they’ll need to be tightened. They can also be compromised by dirt and dust buildup, which causes it to take mistaken readings about the status of the pilot light. Faulty gas valve. The gas valve opens up to release natural gas into the burners. If it’s malfunctioning, your pilot light won’t ignite– a crucial safety mechanism. You’ll probably need professional heating repairs to fix it safely. Cracked heat exchanger. This furnace component separates the warming flame from your household air supply. It’s important for containing the dangerous fumes, such as carbon monoxide, that are released during the combustion of natural gas, propane, and other fossil fuels. A cracked heat exchanger is a serious problem, since it creates the potential for a fire or deadly carbon monoxide leak. Cracks usually result either from overheating, or from rusting and corrosion over time. Either way, a furnace repair technician will need to replace the heat exchanger to restore heating to your home, as well as ensuring your safety. When your pilot light or electric ignition fails on your gas furnace, it can be a miserable experience. It doesn’t take long for the warmth in your indoor air to dissipate, leaving your home freezing cold and incredibly uncomfortable. During very low temperatures, this can even become dangerous. If you can’t successfully relight your pilot light, or your electric ignition isn’t working, you shouldn’t try to fix it yourself. Gas furnaces are complex devices, as well as presenting potential dangers in the form of fires, explosions, and carbon monoxide. For reliable 24-hour heating repairs in New Jersey, call us today at Elta HVAC, at 201-430-2420.